Oppo has announced the launch of its new R9s smartphone in Australia today, revealing the company's next step after its R9 and R9 Plus models. The company recently topped the market share for smartphone vendors in China, according to a report by IDC, and it doesn't appear to be slowing down. The R9s is 'focusing' heavily on photography features, with 16MP front and rear facing cameras boasting apertures of f/2.0 and f/1.7 respectively. Both cameras should perform well in low-light conditions thanks to the all new Sony IMX398 sensor powering the rear camera, and Oppo’s ‘Screen Flash’ technology allowing for night-time selfies on the front. At the heart of the new R9s is a Qualcomm octa-core processor with 4GB memory, and its 64GB on-board storage can be expanded up to an additional 256GB via a microSD card slot. The device will ship with ColorOS 3.0 which is based on Android 6.0. A huge 3,010 mAh battery can be juiced up with VOOC Flash Charge technology, which should get you two full hours of talk time from only a 5-minute charge, and some newly developed power-saving optimisations should keep you afloat for longer. At the mid-range price of $598, the R9s features some reasonably premium features, like a Full HD (1,920 x 1,080) AMOLED display, an advanced fingerprint reader and a new “Six-String” antenna design that claims to improve both 4G and Wi-Fi signals. 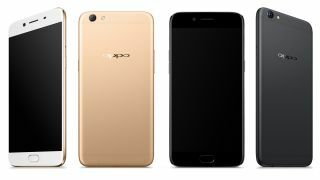 The Oppo R9s will be available January 30th, or you can pre-order it now from JB Hi-Fi, Optus and Woolworths Mobile, as well as Oppo’s new partners, Vodafone and Virgin Mobile.